Amidst all hearsay and rumors, Konstant redefines itself with a firm belief as one of the Top Mobile App Development Company 2018, enlisted by Goodfirms. 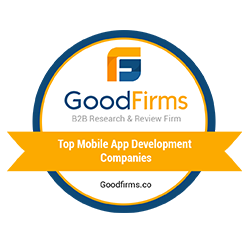 PALO ALTO, CALIFORNIA, UNITED STATES, July 12, 2018 /EINPresswire.com/ -- Goodfirms has just rolled out a brand new list of top mobile app development companies. It essentially includes the names of industry leaders who have performed remarkably in particular domains and have been simultaneously been appreciated by the clients. Konstant has been in revenge with its own ranking over years and has been constantly putting its efforts to roll out the big map, simultaneously hold a significant position in it. Doubtlessly Konstant finds it a very beautiful and gratifying revenge. Konstant has crusaded across all industry verticals and has endeavored to make their customers happy throughout. They have always enabled their customers to respond quickly to the changing market dynamics. Bringing about cost-effective and reliable solutions that satisfy customer's requirements is the basic aim behind the work processes at Konstant. 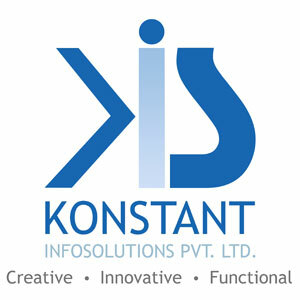 Konstant has taken new technologies in its stride ranging from mobile app development – iOS and Android, web development, app designing, web designing, IoT development, e-commerce development, chats/Payments/NFC/Weather/Games/Health/Multimedia/E-Commerce etc., and is always geared up to imbibe new ones in its comprehensive portfolio. Konstant has survived through periods of positive and negative events and has dealt successfully with moods and interactions with its clients. The success graph is up and trending with the development of 550+ mobile apps. Out of these 350+ are iOS apps and 200+ are Android apps. Accompanying 2500+ happy clients, it relishes being on the crest. Goodfirms is a research and review community that helps software buyers and software seekers find each other globally. They have an innovative research process to evaluate the firms. General criteria include - consistency with delivery timelines, budget constraints, reviews from clients, flexibility to adopt new technologies, history of previous projects, ability to support cross-platform, the inference of business model, maintenance after deployment, peer pressure and communication with clients etc. According to Vipin Jain, CEO, and co-founder of Konstant Infosolutions, "Konstant has always worked with the latest technologies and tools demanded by the market. With a focus on delivering receptive user experiences and creating expert level UI/UX designs." He further says, “I’d like to see my firm go ahead with the most prestigious brands and partners, consequently helping startups and mid-level enterprises with striking solutions to make their identity”. The Goodfirms team has selected these companies because of their expertise and work quality, taking into account their portfolio and the reviews provided by clients. Konstant Infosolutions is an industry leader in delivering successful Mobile and Web development solutions across the Globe. At Konstant, we strive hard to deliver the best within the estimated cost and timeline. We have been consistent in delivering industry-specific solutions that ensure customer satisfaction. Goodfirms is a salient pedestal for mobile and web app developers who are looking for dependable top mobile app development companies with avowed reviews to build up their projects. It exposes the mobile app development company to the right audience. As the numerous visitors on Goodfirms manifest with the software, it helps convert those valuable visits into leads. 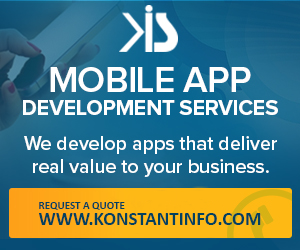 To know more about Konstant’s mobile app development services, click here. Konstant Infosolutions creates the most engaging and high-performing mobile app experiences, aimed to provide high returns and profits to the business owners. Konstant has firmly achieved its offshore reputation by dedicatedly working for 15 long years. It has been consistent in its approach and has reacted spontaneously to changing technological innovation. The company provides a multitude of mobile development services including Internet of Things, Beacon, On-demand solutions, messenger applications, Artificial Intelligence, Big data Analytics and has been spanning multiple industries and business verticals. App development, inventory management, ERP software, CRM software, data visualization, E-commerce software, order management, warehouse management, marketing automation, SEO and Content management are some of the software categories in which it deals. Konstant Infosolutions is a globally recognized brand for developing web as well as mobile app solutions. It is a goal-oriented company with the ability to deliver high-quality solutions in key industries including education, real estate & property, on-demand, social networking, banking & finance, gaming, events & ticketing, travel & hospitality, eCommerce, transportation, food & restaurant, oil & gas. They have also added app prototyping and wearable tech development to their list of services.